Kubrick's classic film is a study in the hypocrisy and the gap that exists between waging war and the politics of war and its impact on humanity. Mr. Kubrick's picture — based on a 1935 novel by Humphrey Cobb — has attained a status commensurate with its meticulous craftsmanship and sadly timeless message. Though book and movie vary considerably, both were inspired by a real-life miscarriage of justice in the French army during World War I. The film's title, like the novel's, comes from a well-known line by the English poet Thomas Gray: "The Paths of Glory lead but to the grave." And partly because of that, an antiwar label more suited to the book has attached itself to the movie. More than an antiwar film, it is fundamentally an attack on bureaucracy and its attendant rigidity, hypocrisy and cumulative ineffectiveness. The movie is set in World War I amidst the incredibly destructive and futile trench warfare between France and Germany. 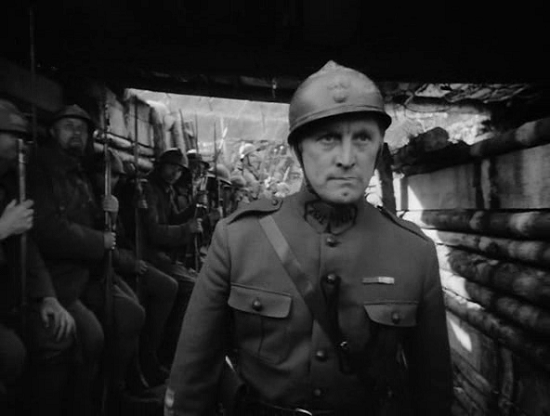 In 1916, French Commander Broulard (Adolphe Menjou) wants General Mireau (George Macready) to have his battered division take the "Ant Hill", an impregnable German fortress, promising Mireau a promotion if he succeeds. 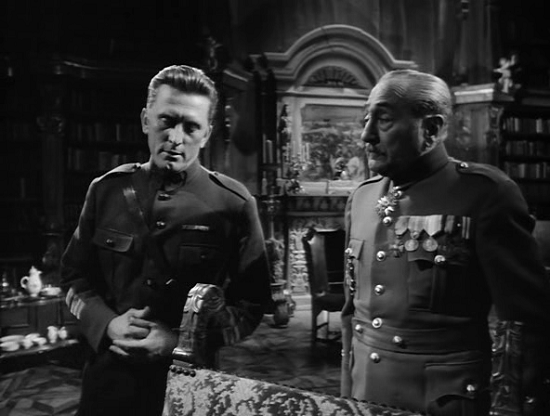 Mireau orders Colonel Dax (Kirk Douglas) to lead the charge, which is a complete failure. When soldiers are pinned down by German artillery and machine gun fire, Mireau orders his own artillery to fire on their own trenches, screaming, "If those sweethearts won't face German bullets, they'll take French ones!" When the assault does not go forward under heavy enemy bombardment, the general is infuriated and demands that three men be arbitrarily chosen to stand trial for cowardice, an offense punishable by death. Col.Dax defends these men at their court martial. The battle and trial scenes are about as good as have ever been filmed and the high level of tension is sustained throughout the movie. After the film's climax has occurred, Col. Dax goes looking for his troops and finds them relaxing at a cafe. What he and the viewer witness there is possibly the most affecting scene portrayed on the screen. The picture is visually alluring from the start. Much of the early action takes place in the trenches, evoked with unsettling accuracy by the film's art director, Ludwig Reiber, and fully revealed in two audacious tracking shots by its cinematographer, George Krause. And not enough can be said about the lucidity and taut excitement of the movie's one battle scene, the failed attack that initiates the disgraceful acts from which this picture draws its dark power. But the film's most unnerving moments play out in the sumptuous chateau that serves as headquarters for Gen. Paul Mireau, the movie's principal villain, modeled on a similar character named Assolant in the book. Here, far from the muck of the trenches, the film's most disturbing images unfold, as high-ranking officers calmly plot the basest turpitude. Realizing that any film treatment of Mr. Cobb's book needed a moral center, the film's co-writers—Mr. Kubrick, Jim Thompson and Calder Willingham—chose Col. Dax, who is both less noble and less central in the novel. 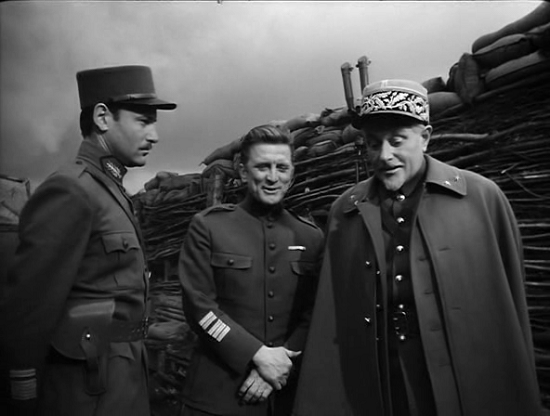 Mr. Kubrick wanted Kirk Douglas for the part, and the actor, then in his heroic prime, brought with him not just his trademark indignation, but also the star status necessary for the project's financing. Mr. Douglas, to be sure, has some excellent moments defending the doomed soldiers against an indifferent panel of military judges; even as there is never any hope they will be spared. And those playing the condemned men—Ralph Meeker is the most famous—also do fine work, as do several others playing various low-level officers and enlisted men. But the script's best and, paradoxically, funniest lines go to the two men who symbolize the hierarchy's decrepitude: Gens. 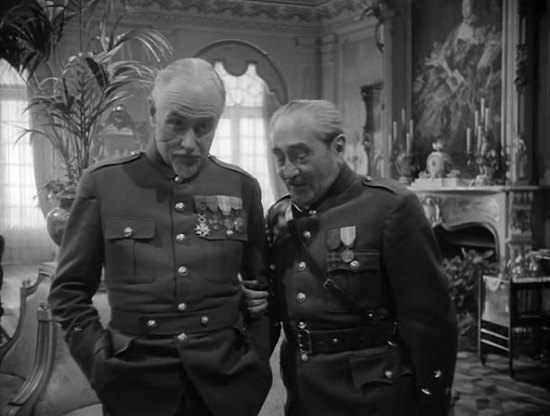 Mireau and Broulard, portrayed with chilling effectiveness by the screen veterans George Macready and Adolphe Menjou. More than anything else in this film, their verbal jousts, at once entertaining and repugnant, reveal the indifference of those in charge toward those they command. 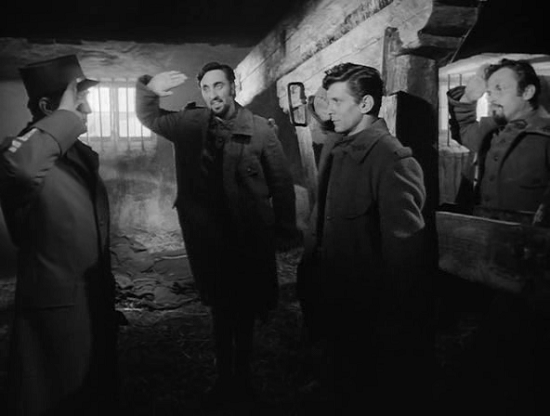 Much has been made of the film's last scene, in which a young German girl (Susanne Christian, later the director's wife) is thrust before a tavern full of rowdy French soldiers and forced to sing. The episode does not appear in Mr. Cobb's novel. But Mr. Kubrick makes the coda work—with Mr. Krause's camera locking onto a host of careworn faces as beasts transform into men while listening to the girl's halting version of a sentimental ballad. The message is unmistakable: Gens. Mireau and Broulard may be unredeemable, but ordinary soldiers, even after the brutality of the trenches, can be human again. An ability to pivot drastically without strain — to go from black comedy to heart-rending affirmation — was one of Mr. Kubrick's great gifts as a filmmaker. " 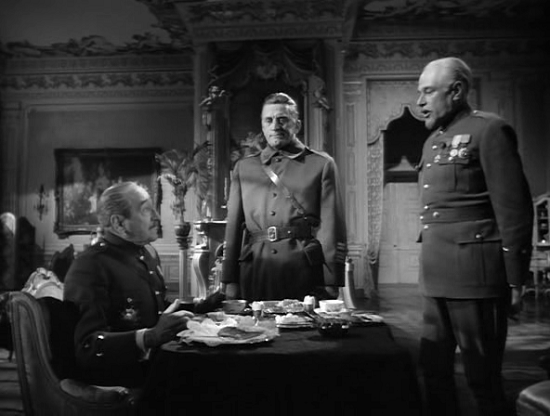 Paths of Glory" finds him having just refined this skill, along with other emblems of his signature style. And for that alone the movie remains important. But the picture's enduring appeal comes from its unflinching application of Lord Acton's famous warning that "power tends to corrupt, and absolute power corrupts absolutely." Here — in the midst of war, when the stakes are at their highest—Mr. Kubrick illustrates the consequences of unchecked ambition and mass complacency.
" 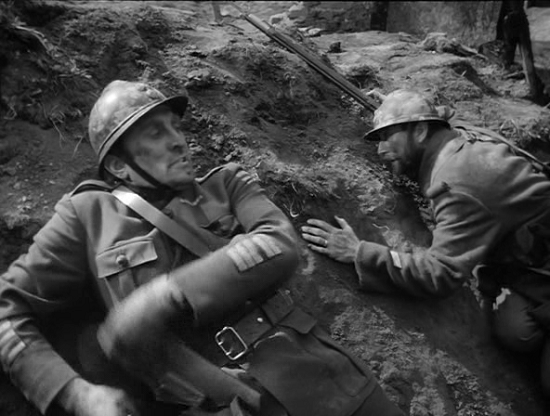 Paths of Glory" has a deserved reputation as one of the greatest anti-war films. The role of Reason, the nature of absurdity, courage, and cowardice are all examined in this simple story, and the implication is clear that it is better to die bravely in front of a firing squad than to grow comfortable with mendacity and cower before the truth.